I guess everyone here knows I'm pro skincare that uses natural ingredients. The Body Shop is one of the convenient brand that serves me well. I know a lot of you will argue that The Body Shop is using the "natural" basis as corporate image. 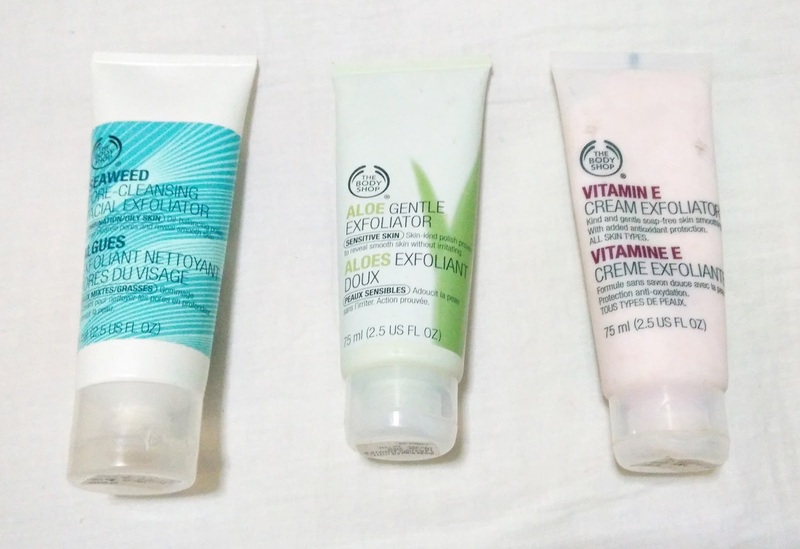 Nonetheless, it is very convenient to grab The Body Shop's product when you're on-the-go. Recently, I went to The Body Shop to grab a facial scrub. I wanted a scrub that scrub that can remove my clogged pores but the shop assistant wasn't that helpful. So I grabbed 3 tubes to test out and see which one suit me most. Later I find that the three scrubs I grabbed serve different purposes respectively. This has a very rough exfoliate agent, which is fine jojoba beads and olive stone. I find this useful for removing dead skin cells, particularly the rough ones. Use this sparingly because it is seriously very rough. In fact, I recommend you to use it only when needed. 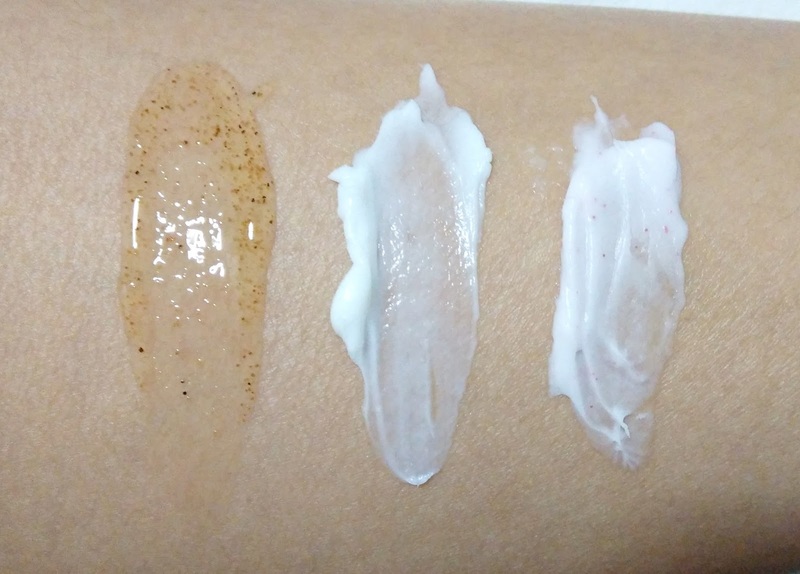 It feels as if a layer of your skin gets peel off after using. Good for: Removing dead skin cells. Removing dirts from pores. Not good for: Sensitive skin. Acne-prone skin. Avoid using this after you done peeling procedure. This is my favourite scrub of all. The exfoliate beads are gentle but compact, I'm not too sure what it is made of though. It is good to use on sensitive skin as well. It removes my skin thoroughly but gently. When I desperate to get rid of my dark spots and acne scars, this is the product that I rely on. Good for: Revealing fresh layer of skin. Sensitive skin. If you are looking for a scrub that removes your dead skin cell, this is NOT the scrub. The beads are made from jojoba but it is not rough as the seaweed scrub. It is round and rubbery. I find it good for skin polishing. It gives that shiny glow on your face after using. 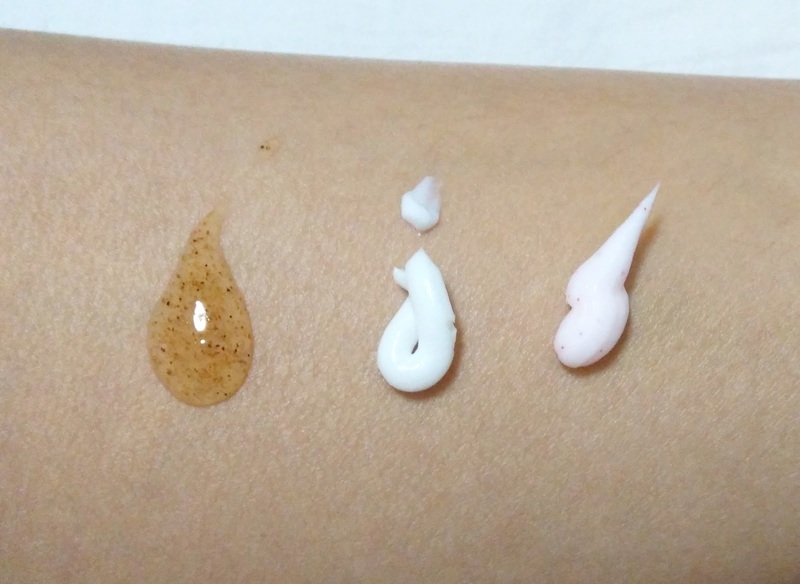 Not good for: Exfoliating for the purpose of removing dead skin and unclogging pores. I wish I bought more facial scrubs to compare. Maybe next time. If you are looking for a basic facial scrub that does the exfoliating work in general, go for the Aloe Gentle Exfoliator. It is my personal favourite. And I think it is mild to the skin, but yet able to deliver its job to remove dead skin and unclog pores. If you have any favourite facial scrub in your list, do share it with me in the comment below so I can try it out.